When I contacted Mark Long last month about the possibility of holding a shirt run this weekend for my friend and frequent training partner Jenn, he replied that it fit his schedule but it might be too hot. We agreed that it would probably be hot but that everyone should be used to the heat by now anyway so the run was on. 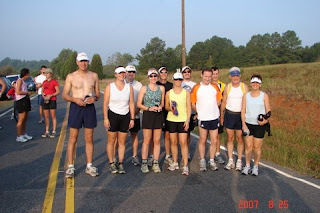 As the popularity of MTC has grown, so have the shirt runs and soon we had a full group of runners ready to assemble by the Dog Pen. Another friend, Frank Werner, husband to my Marathon Princess, Karla was also planning to join. Frank has made the commitment to run his first marathon this Fall and today's run would be his longest training run so far. We were very excited for Saturday morning to arrive so that we could run and see many other of our wonderful friends from this bunch misfits. The forecast was not looking good and as we drove down in the pre-dawn darkness , it was obviously going to be a very humid day too. Jenn and I were the first to arrive but within moments a large group had assembled and after some greetings and hugs it was time to shuttle over to Mangum for the start. Jenn and I piled in the big SUV of Alan Hughes along with Frank and Karla, Laura and Lisa Howell. Alan was being smarter than the rest of us and not running today. After a quick group photo and one of the newbies, we started running down the road. Jenn and I were joined by Lisa who was here for her shirt too. Her sponsor Sean was called away to work and couldn't run so Lisa ran with us. Karla and I had met Lisa while training on the track at NCSU for Boston two summers ago. We took off at an easy, steady pace knowing that we had a lot of heat and hills and many miles ahead. It was definitely warming quickly and we were soon drenched in sweat that would not evaporate but just filled our shoes. Any shade was welcome and thankfully there was a lot in the early miles. As always, Mark had put out water at several places along the road. With the extreme conditions today though everyone was happy for the assistance Alan was providing. Every few miles he would drive ahead and wait with a large cooler full of cold drinks and ice and I know it made a big difference in helping us complete the run without anyone suffering from heat stroke. The three of us continued to run steadily toward the end with great fun and conversation until we finally reached Bethel Church Hill. About halfway up I took a walk break and the ladies pulled ahead. Boogie man Doug pulled alongside in his truck and we talked while I walked and tried to run a little. Once I reached the top I began to try to catch back up to Jenn. They were about to miss the turn on the now paved road to the Dog Pen so I yelled for them to turn. I was gaining on them but then took another walk break when I caught up to Mike. I slowed to talk to him for a few minutes and then took off in pursuit again. In a few minutes it became obvious they had picked up the pace and I was not going to catch them. I was now really feeling the effect of the heat and humidity and the sun was really bearing down. To make the effort to catch them I would probably have passed out from heat exhaustion, so I backed off and settle in to just survive the last 2 miles. Eventually everyone made it in and survived. We all whined a little and then spent time socializing in the little bit of shade we could find beside the road. Frank told Karla and I , that he always thought we marathoners were crazy for doing this and now he knows we are. Even with the heat it was still a good time. Thanks to Mark for organizing and Sarah Jane for picking up the pizza and to all the other volunteers. And a big Thanks to Alan for the roving aid station and ride to the start. Laura has posted some photos you can link to here.